Tehri Garhwal is one of the western most district of the Uttarakhand State, located on the outer ranges of the mid Himalayas which comprise low line peaks rising contiguously with the planes of the northern India. The district lies between the parallels of 30.3` and 30.53` north latitude and 77.56` and 79.04` east longitude. Uttarkashi from the north, Rudraprayag from the east, Puri Garhwal from the south and Dehra Dun from the west are bounding the districts. On the western front Yamuna river separates it from Jaunsar Pragana of the Dehra Dun district while Bhagirathi rising from the north of the Gangotri in the district Uttarkashi touches the district near village Nagun. Total area of the district is 4421 sq. kms (Census 1991) . The district headquarter is located at New Tehri Town since 1.4.1989, Earlier Narendranagar was the district headquarter. Lying on the southern slopes of outer Himalayas, Tehri Garhwal is on of the sacred hilly districts of Uttarakhand State. Before the creation of universe, Lord Brahma is said to have meditated on this sacred land. Muni-ki-Reti and Tapovan of the district are the places of penance for the ancient Rishis. Its hilly terrain and lack of easy communications have helped it to preserve its culture almost intact. 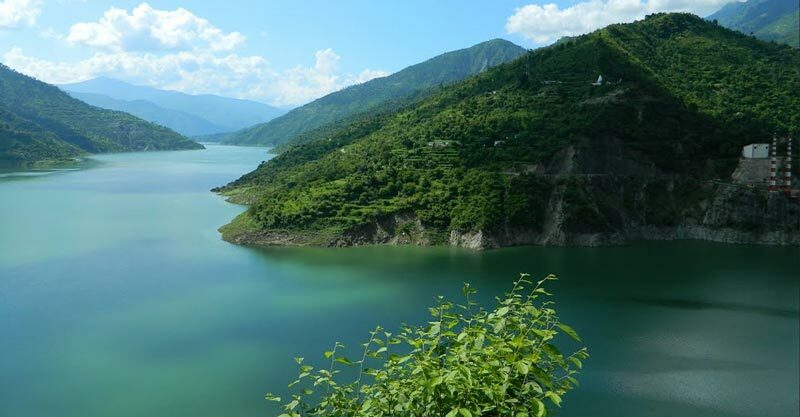 Tehri and Garhwal are the two words combined for naming the district as Tehri Garhwal. While the prefix Tehri is the corrupted form of the word `Trihari` which signifies a place that washes away all the three types of sins, namely sins born out of thought (Mansa), word (Vacha) and deed (Karmana), the other part `Garh` means country fort. In fact during olden days possession of number of forts was considered as a significant measuring rod of the prosperity and power of their rulers. Prior to 888, the whole of the Garhwal region was divided into small `garhs` ruled by separate independent kings known as Rana, Rai or Thakur. It is said that the prince Kanakpal who hailed from Malwa visited Badrinath ji (presently in Chamoli district) where he met the then mightiest king Bhanu Pratap. King Bhanu Pratap was impressed with the prince and got his only daughter married to him and also handed over his kingdom. Gradually Kanakpal and his descendents extended their empire by conquering all the garhs. Thus up to 1803 i.e. for 915 years the whole of the Garhwal region remained under their control. During 1794-95 Garhwal was under the grip of severe famine and again in 1883, the country was terribly shaken by an earthquake. Gorkhas had by then started invading this territory and heralded their influence over the region. The people of the region being already affected by natural calamities were in the deplorable condition and therefore could not resist Gorkhas invasion. On the other hand, Gorkhas whose several attempts for capturing the fort Langoor Garhi had earlier failed, were now in powerful position. In 1803, therefore, they again invaded Garhwal region when King Pradumn Shah was the ruler. King Pradumn Shah was killed in the battle in Dehra Dun but his only son (Sudarshan Shah was minor at that time) was cleverly saved by the trusted courtiers. With the victory of Gorkhas in this battle their dominion was established in Garhwal region. Later on their kingdom extended up to Kangara and they ruled over this region continuously for 12 years before they were thrown away from Kangara by Maharaja Ranjit Singh. On the other hand Sudarshan Shah could manage help from East India Company and got his kingdom freed from Gorkha rulers. The East India Company merged Kumaon, Dehra Dun and east Garhwal in the British Empire and the west Garhwal was given to Sudarshan Shah which was then known as Tehri Riyasat..
Praesent dictum eget erat quis luctus. Aenean sit amet condimentum purus. Cras dictum lacus urna, sit amet molestie ligula tempor in. Curabitur fringilla scelerisque tristique. Curabitur vitae neque gravida, pretium dolor id, vestibulum dolor. Mauris varius tincidunt turpis, in volutpat velit dictum id. Nulla facilisi.